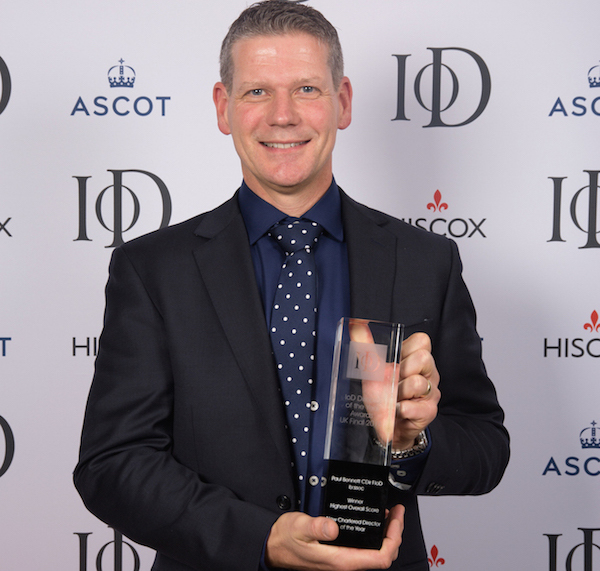 Paul Bennett, Executive Chairman, of BSSEC has won the IoD’s New Chartered Director of the Year Award. The New Chartered Director of the Year award recognises excellence of achievement across the IoD’s Certificate and Diploma in Company Direction examinations, and in the final assessment for Chartered Director. Having beaten off competition from across the UK, Paul was shortlisted along with 2 others in September. He was delighted to learn that he’d been their highest scorer in the exams and was subsequently named winner at the Director of the Year Awards at the end of October. Paul, who is also a Chartered Engineer, became a Chartered Director after 12 months’ of study. He set up BSSEC in 2005, having identified the growing market for low carbon, low energy buildings and the business quickly grew as demand increased for low carbon designs and property audits. The speed of the expansion eventually encouraged him to look for ways to broaden his skills base. “Overall, the training has been an immensely positive experience. Energy is a very political and volatile arena to work in – markets and jobs appear and disappear very quickly – so every business within the sector needs to be agile in order to survive. Brexit, of course, has added to the uncertainty and impacted on areas such as investment and spending, at least in the short-term. “Coming up, we have the government’s energy policy review at the end of this year and the Minimum Energy Efficiency Standards (MEES) regulations in the next 2 years. We are prepared with our response to both.